There we were. 8.30pm on Tuesday night and 6500 feet over Magaliesberg general flying area and doing night aviating. 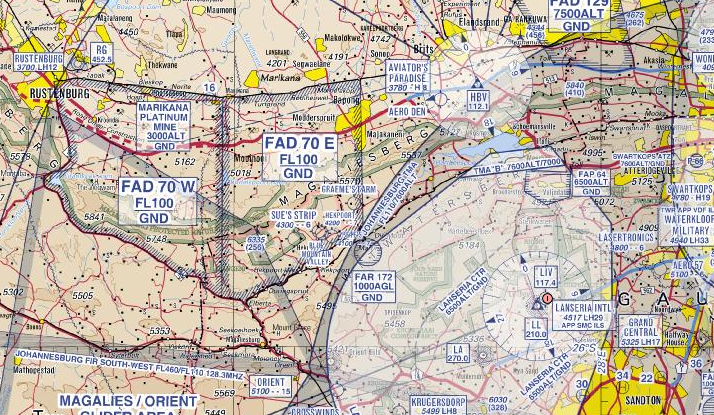 I had just conducted a few stalls in ZS-CTP and turned to a heading of 70 degrees. Suddenly a green light flashed directly in my eyes! For a moment my heart rate leapt, it appeared to be an aircraft close by! Planes have coloured lights on the wings and tail. Red for left, Green for right, White for the tail. That’s so that you know which direction a plane is flying at night. If you see green, it’s flying with its right wing towards you from the left and this one looked close. Were we going to collide? I had not experienced a laser aimed straight at my plane before and the effect is eery as well being bright and shocking. While you’re able to continue flying by keeping your eyes away from the light, it damages night vision which takes up to 20 minutes to settle. All the in-cockpit lighting has a red tinge so that night vision isn’t affected. 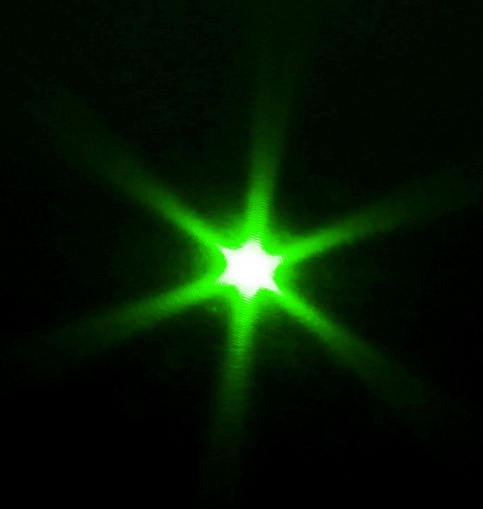 Having a green laser aimed at your eyes is dangerous to put it mildly. The effect of a laser aimed at you inside a cockpit at night looks something like this. The origin was unclear. Someone close to Hartebeespoort Dam had decided to hell with the aeroplane interrupting his or her DSTV or Verdi, it was time to take action. This needs some discussion. As the growth in the number of housing developments in this area increases, there’s a misconception. That the owners of the new golf estate town house have utter silence on the outskirts of the big city. Unfortunately that’s created a false sense of place. The Magaliesberg GFA is Lanseria’s main training facility and has been used by decades by aviators to hone their skills. Many of these same aviators are now flying for commercial airliners into which the middle class – including ms or mr flash gordon green hornet – climb to indulge their travel fantasies, or to head off to Cape Town or whatever. While these land developments are not exactly under the GFA, they’re only a few nautical miles away, but at 8.30pm that can sound a little closer. I do feel a bit sorry for the blokes who coughed up a few million for the experience of living in the bush where crickets and owls and Piet-my-vrou’s create their beautiful veld noises. Yet its not the Kruger. It’s a few miles away from one of the busiest airports in Gauteng. Note Hartebeespoort Dam and immediately to the left – the Magalies GFA. And firing a green laser into my eyes while I’m doing recovery from an unusual position is not acceptable. I fold my arms and close my eyes as the instructor puts the plane into a series of twists and turns, and eventually a dive or similar. Then he says “It’s yours” which is the signal to open your eyes and try and make sense of what’s going on. It’s a split second decision after a quick reference to the Primary Flight Display to see what attitude the plane is in, then centre controls, power back, kick the rudder to correct, lift the nose and as the plane comes up, on with the power again. Very exciting to do and challenging. Aviating like this when some inebriated sod is pointing a laser at your face is a serious challenge. Finally the lunatic stopped pointing the laser and we continued the series of night maneuvers. If the person doing this is caught siting a laser at an aircraft, particularly a commercial aircraft, the punishment is significant. Civil Aviation authorities will hit you with a terror charge. Secondly, I suggest a cease and desist on the part of the Green Hornet Country Club member. You really don’t want the embarrassment of an angry aviator knocking on your door or an attempted murder charge and whomever it is is now becoming known to us. Think about what you’re doing. You may really regret continuing to point your laser at various aircraft who have every right to fly where they do. It’s not our fault that you didn’t do your research properly before you bought your little rondavel at Golf Estate X. This entry was posted in Uncategorized by desmondlatham. Bookmark the permalink.